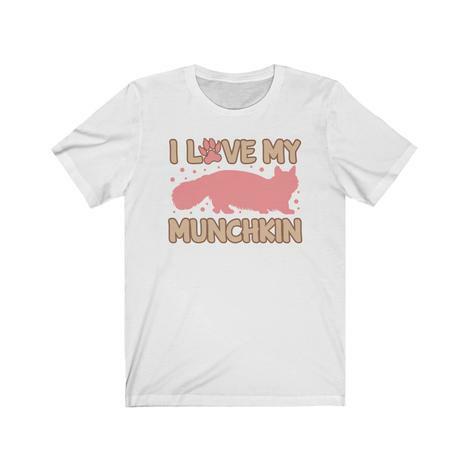 Looking for adorable munchkin cat gift ideas for your favorite cat lovers? Or maybe you just want to show off your love for this adorable breed? 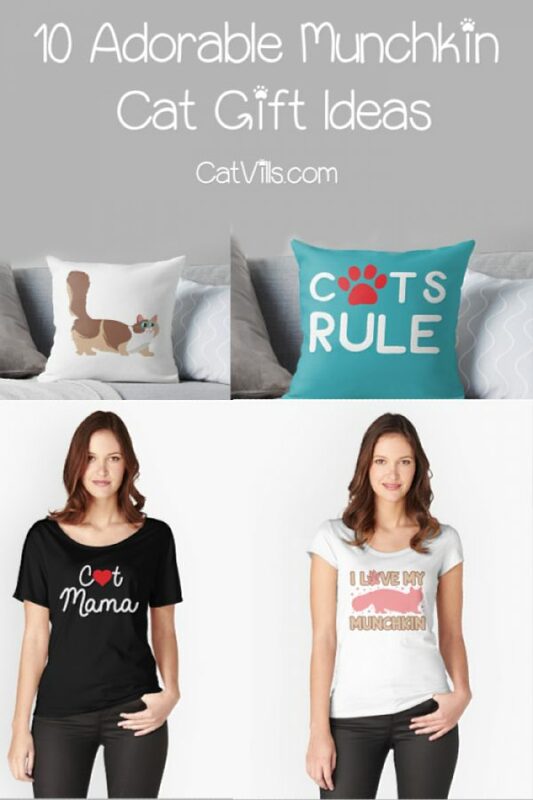 I’ve got you covered either way with these darling t-shirts, throw pillows, and more that celebrate all things munchkin kitty! They make perfect holiday gifts, birthday presents, cat adoption gifts, and more! Check them out, then head to our cat lovers gift shop for more great gifts! If you’re a proud owner of the munchkin cat breed, you need this darling kitten tee! It’s one of my all-time favorites and makes me so happy just looking at it! Seriously, don’t you want to snuggle that cute kitty? 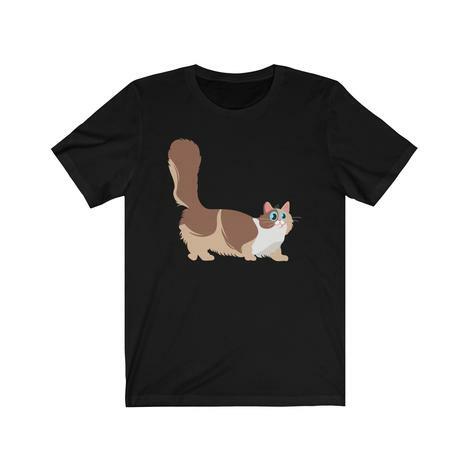 This super colorful Munchkin Cat graphic T-shirt makes a great gift for friends and family. 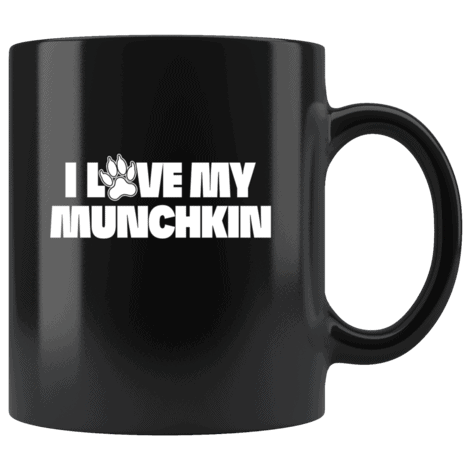 If you’re looking for a simple way to proclaim your munchkin love, you really can’t go wrong with this one! It’s perfect for your morning coffee or tea! This one is for those of us who want something a little flashier! It’s one of my all-time favorite shirts because I just love the colors. If you get it on Redbubble, you’ll find it in 7 different colors. Prefer to shop on Amazon? It comes in 5 colors there! I personally love either the white or the brown. 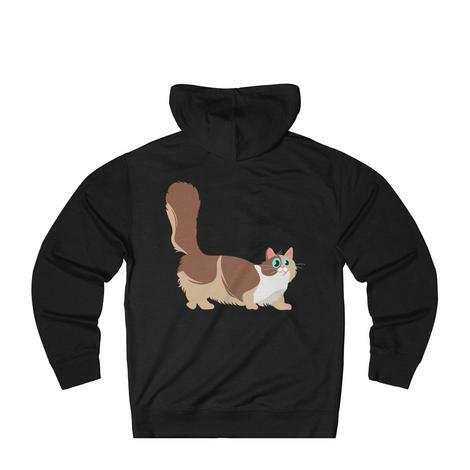 The super warm and cozy version of my favorite munchkin cat gift idea! This hoodie is so soft and snuggly, just like your kitty! This cute little guy would look perfect on your sofa! Just keep in mind, if your kitty sees it, she’ll assume it’s for her! After all, it is literally a cat pillow! On another note, I am absolutely obsessed with throw pillows from Redbubble! The quality is outstanding. I have a couple of their pillows and they’ve held up against several washings, dirty dogs sitting on them, and a teen son throwing them around his room. 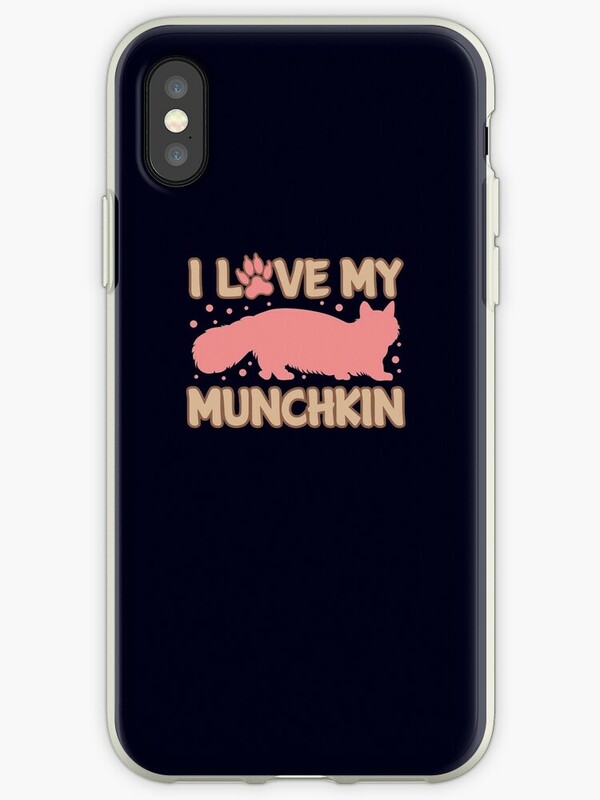 Protect your iPhone in style with this adorable munchkin cat phone case! It’s available for all iPhones from 4 and up (which is great news for those of us who still have older phones!). I recommend the Tough Case, versus the Snap, because it offers a bit more protection. These next few aren’t munchkin cat specific, but they make perfect gift ideas for all cat lovers! This one says “Cats Rule,” which we all know is 100% true! I love the colors on this one, don’t you? Hey, did you know that you can buy just the cover? If you already have a throw pillow and want to save a bit of money, it’s a great option. Cover + insert is only a few dollars more though, and I can never have too many throw pillows! 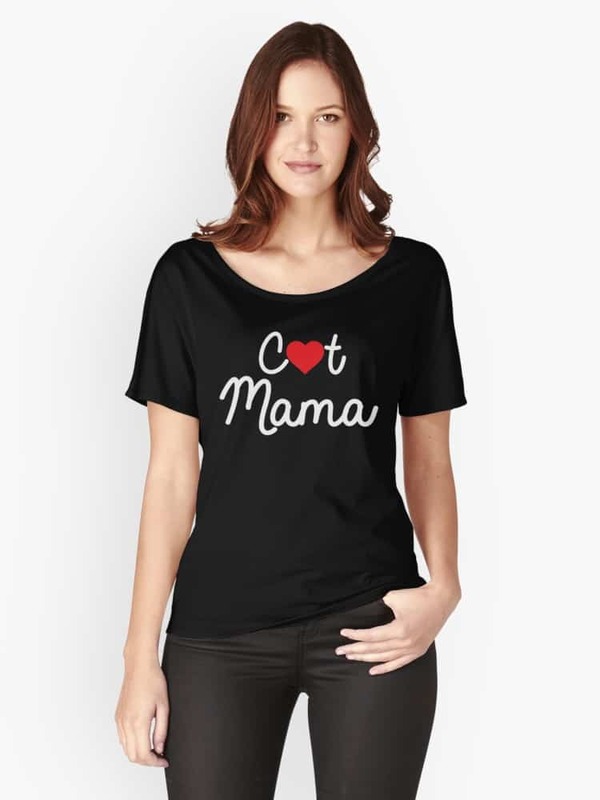 Want the whole world to know that you’re a proud cat mama? You need this adorable and simply stated t-shirt! It comes in 5 colors over on Amazon (and it’s Prime-eligible), or 16 colors over on Redbubble. This is a hilarious gift idea for people like me who spontaneously burst into super long monologues about their cats! I could wax poetic about my Alex the Fuzz and Zoe for hours! 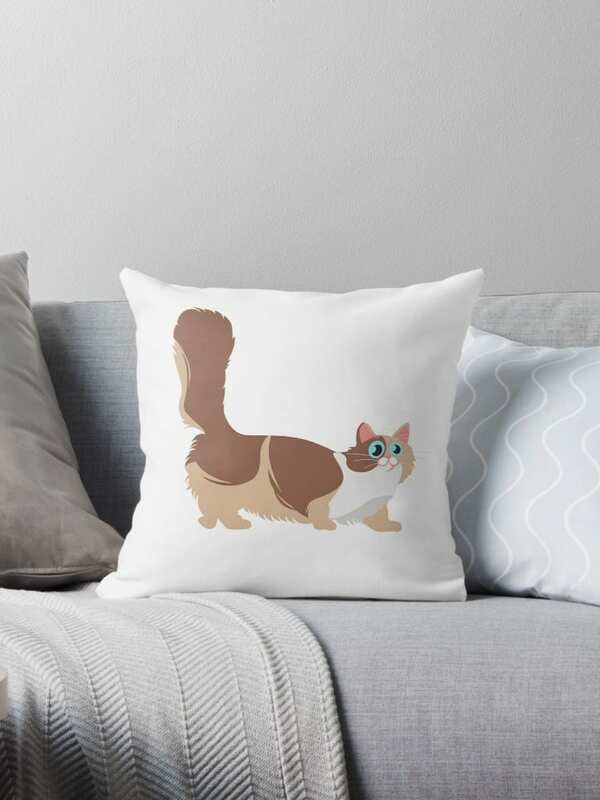 Love these munchkin cat gift ideas so much that you want to get them on other merchandise? Every design is available on pillows, duvet covers, case covers, and more over in our Redbubble shop. On Amazon, you’ll find all of the designs on PopSockets. Which of these munchkin cat gift ideas do you love most? Tell me below! I know quite a few people these would be perfect for. You should also look into the new card game “Cat Lady”! Although I haven’t seen a Munchkin in person, they are so cute! 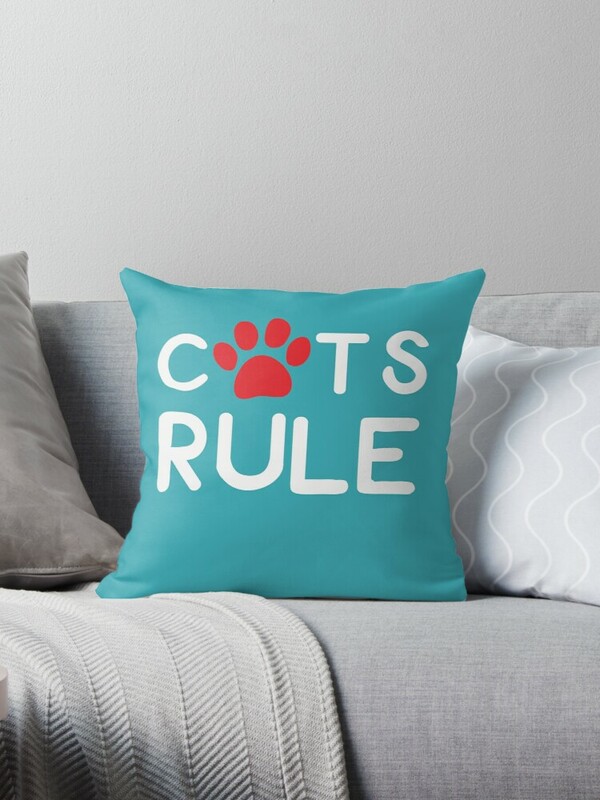 I know a couple of people who would love a Cats Rule pillow! These are all such cute ideas! My stepmom and Dad have 4 cats that they are obsessed with. This gives me a lot of fun gift idea options for them, thank you so much! These are adorable cat gift ideas! I especially love the Cats Rule pillow. Doesn’t it just make you smile? It’s so bright and cheerful! … I have so many people in mind right now (Mother’s Day) – I just have to figure out which cat gifts to get them? MY daughter would love both that hoodie and the popsocket. She is really into that stuff right now, and I think they are cute so maybe I will get her some. This list is awesome! I like all these gift ideas especially the shirts. Oh my goodness, I love every single one of these. 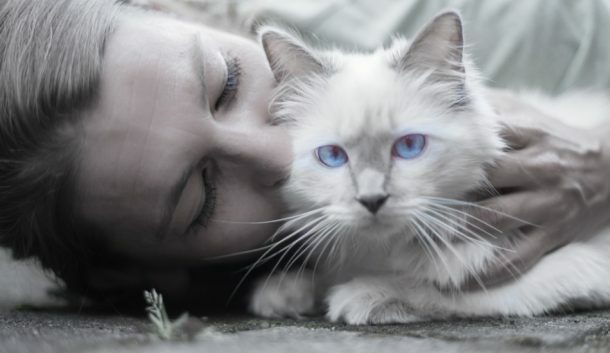 I have a friend obsessed with cats, she would go crazy for these ideas. Oh, I love munchkin cat so much. I have a few cat mamas in my life who will obsess over these.